Video clip synopsis – When our troops were sent off to war in 1914, industry in Australia boomed. Steel was necessary for guns and ships. Broadband MP4 gallipoli_bb.mp4 (4.5MB), suitable for iPods and computer downloads. 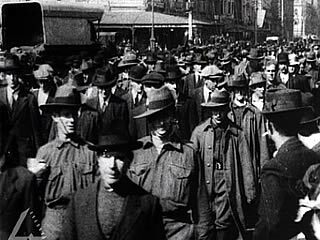 The Effects of World War 1 on the Australian Economy is an excerpt from the film Cavalcade of Australia 1901-1951 (34 mins), produced in 1951. Cavalcade of Australia1901-1951 was produced by the Department of the Interior. In 1914 Australia entered World War I. At the start of the war Australia was a nation whose main economic activity was agriculture and natural resource production. During the war the disruption of international shipping and the channelling of materials to war production meant that many imports to Australia were reduced, or no longer available. Australia began expanding its own secondary manufacturing industries as a result, including the development of steel production. Much of this was focused in the Newcastle area of New South Wales. During 1915 Australia’s main involvement in the war was at Gallipoli, in Turkey, where Australian troops were part of an Allied invasion designed to force Turkey out of the war. The invasion failed, but many people in Australia saw Gallipoli as proof that Australians had passed the 'test’ of nationhood. The end of this clip alludes to the impact that the war had upon Australia’s economy. In this video clip we see a government information film presenting a narrative that explains the development of Australia’s steel industry in this war context. What is the image of war that is presented in the video clip? Consider what words are used, what images are presented. Consider also what typical images are not presented. Why do you think such images are absent from this clip? Look at the variety of footage that is presented to show the Gallipoli experience. Discuss what elements might be real footage from the time and what might be a later reconstruction. Explain how you distinguish between the two. * A person who gained work at the Newcastle steel works. How might each respond to the video clip? Gallipoli is an essential element of Australian identity. If you ONLY had this video clip about Gallipoli, what would you say was the impact of this event on Australia?